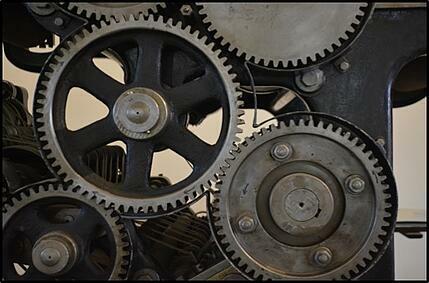 The gears in your final drive perform a number of functions. In the planetary hub, the gear system reduces speed and transmits a tremendous amount of torque. On the drive shafts, the gear teeth engage with the coupler to transmit torque. In fact, transmitting torque is the main purpose of the gears in a final drive. Depending on how the gears mesh together, torque can be multiplied (as in the case of the planetary gear system), divided (to reduce torque and thereby increase speed), or made to remain the same (as in the case of the coupler and drive shaft). The gear teeth are where the actual loads get transferred. Because the gears are dealing with so much torque in a fairly limited amount of space, the gear teeth have to withstand tremendous forces as they come into contact with each other. This requires an extremely hard surface that resists damage, but not so hard that the gear teeth or the gear itself becomes brittle. One way this is accomplished is through surface hardening. 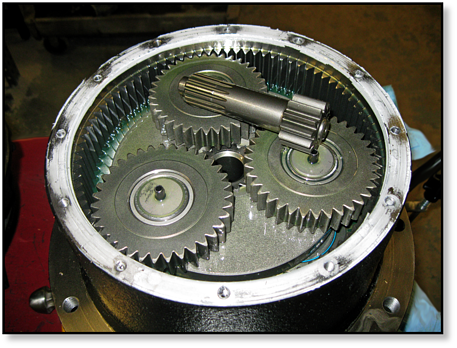 In surface hardening, only the surface of the gear is hardened; the interior of the gear remains fairly ductile. The result is a tough gear that can withstand impact while at the same time having a hard surface that can handle the high forces involved. In most final drives, the gears have been through a surface hardening process (aka: case hardening) process known as carburizing. In the carburizing process, the gears are exposed to a carbon-rich environment as they are heated up to a temperature specific to the steel being used. The gears are held at that temperature, then quenched. They are then usually reheated again, then slowly quenched to relieve any warping or residual stresses that may have developed. As a result of the carburizing process, the gears can carry the loads involved with reducing speed and generating torque for literally thousands of hours without sustaining any significant damage. Keep in mind that there are a variety of different methods for carburizing. Gear oil provides a protective film between the gear teeth to prevent damaging metal-to-metal contact, conducts heat away from critical components, and provides lubrication to minimize friction. Gear oil is more viscous (thick) than engine oil; it's made that way so that it can flow between the gears and other components in the planetary hub. Its sulfuric scent comes from using sulfur as an additive so that it will function well under extreme pressure (e.g., when the gear teeth contact each other to transmit torque). It is important that the gear oil levels are periodically checked and that the gear oil is changed as recommended by the manufacturer. Gear oil will degrade over time and form a thick, useless sludge that can do more damage than good. If gear oil begins to leak from the final drive, it allows abrasive contaminants to make their way in. Leaks should be addressed as soon as possible. 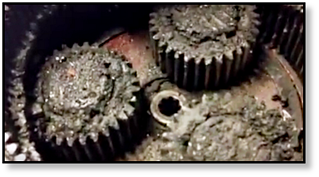 A significant amount of damage to gears results from contaminated gear oil. When gear oil becomes contaminated with debris, for example, the gears experience cracking and pitting on the surface, which in turn can quickly lead to catastrophic damage. When the gear oil isn’t changed often enough, it leads to faster surface wear and a significantly shorter lifespan for the gears. This faster surface wear can actually cause the gear teeth to wear away until they can’t do their job anymore. In the picture below you can see a lower shaft from a Hy-Dash final drive where the gear teeth were significantly worn down. The final drive failed because the gear teeth were so worn down they could no longer engage with the coupler. This meant that no matter how fast the lower shaft would turn, the upper shaft never turned because no torque could be transferred. Gears need to be replaced when their teeth no longer have a flat surface on the edge of the splines and their tips almost look like jagged points. If your gears look like this, they need to replaced as soon as possible. They adversely affect the performance of your final drive, and can eventually lead to failure. When the machine itself is abused (i.e., running at high speeds for extended periods of times, unnecessary overloading, etc. ), the gear teeth will bend and eventually fracture. Broken gear teeth will quickly lead to severe damage in other parts of the final drive but, fortunately, they do not occur very often. Of course, when broken teeth occur, the gears need to be replaced. The gears are an important part of your final drive, and their maintenance is important. If you have to fix a final drive, you may have to deal with some gear issues. Keep the gear oil changed, and address leaks as soon as possible. 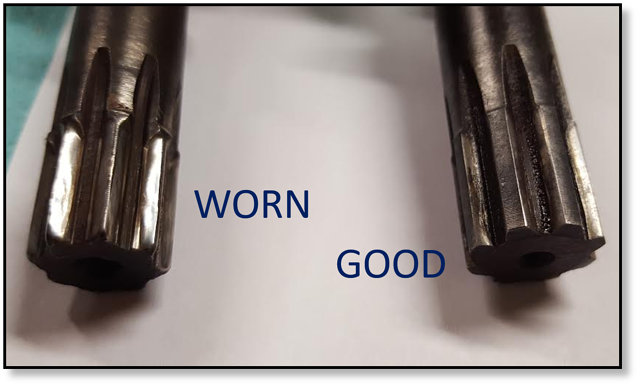 When the gear teeth on your final drive start showing signs of wear, they need to be replaced as well.